Worldwake release has come and past and now you’re sitting at home with a stack of new cards. You’re looking at your EDH decks thinking if you should update them with your shiny new cards you pulled or traded for. 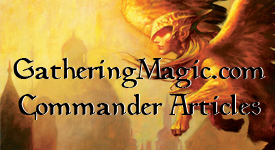 While EDH isn’t a rotating format (like Standard and Extended are), there are always new exciting things that you can add to your decks with each new set. Even if you think that you deck is perfect the way it is now, why not take a look at it with some of the new cards from the set. I do it each time a new set is released as it’s always the most logical time to update you deck. Timing-wise, it gives you a chance to play around with the new cards. Maybe something is better than you thought it was, or didn’t give something a chance and now it’s seeing play in all of your decks. Maybe I was wrong with my Worldwake review and you saw something I missed and it’s been frustrating your friends ever since. Maybe you ditch the old way of playing in your old deck and develop a new way that your friend can’t deal with. And isn’t that always the best feeling? The cards that you should include in any multi-color deck are the man-lands. They are now replacing your Invasion tap lands, or going along side them. Yes, the inclusion of these will automatically change the way your decks play out. My Sygg, River Cutthroat deck now has Creeping Tar Pit, suddenly a man land that does 3 unblockable damage triggers Sygg can change the way I play that deck. Celestial Colonnade in your Rafiq of the Many deck now makes a 5/5 flying vigilant double-striker. You see what I’m saying? Both of these open up new ways of playing the deck. With Creeping Tar Pit, suddenly I have a nice bluffing land that my opponent will want to kill since it will whittle them down, but I don’t have to activate it until I want to. I used to have Nantuko Monastery in my Rafiq deck, but I wouldn’t get Threshold to trigger all of the time and it didn’t have evasion. Now, I get a land that produces colors and a more efficient way to kill opponents. But the man-lands aren’t all, you can find plenty of cards that benefit what your decks are doing already. My friend has a Savra, Queen of the Golgari EDH deck (that hopefully you’ll see soon on this site) that has benefited from Butcher of Malakir. He can now pay two life and have each opponent sacrifice 2 creatures. Terastodon is a great reanimator target that will completely change the board once it hits. Seer’s Sundial turns a deck that runs Crucible of Worlds into a card drawing machine. There are even cards that have inspired me to build new EDH decks to abuse them. Bazaar Trader has now made me start to build Red decks that I can run much more politically (like what I’m doing with my Kazuul, Tyrat of the Cliffs deck). Stoneforge Mystic might make me run more Equipment in decks rather then just Auras and since I’m running White, I can “Flicker” her out and have her trigger again and again. It’s not just rares that are making a difference. Halamar Depths and Trade Routes go amazingly well together (and if you don’t have Trade Routes in a landfall dedicated EDH deck, then shame on you). Quest for Renewal has found a place in my Rafiq deck because of it’s interaction with Stoic Angel. Even Arbor Elf might want me to think about running more Forests in decks where I’d run non-basics instead. You don’t have to feel like you have to run Jace in EDH decks or it won’t run well. Your deck is 100 different cards to find combos and synergies to do different things with your cards and your opponent’s mind. Except for the dual man-lands (which will always see play, pick them up and hold onto forever), nothing I mentioned will break the bank and some of the more competitive players will gladly throw in during trades. I was ecstatic that I was able to find a foil Bazaar Trader this weekend and traded for it right away. Luckily, he was another EDH player so he was happy that someone wanted it. But it’s not just adding Worldwake cards to your EDH deck (which has been the main part of this post), it’s also taking the time to see what’s not been making the right plays. Has that certain card been sitting in your hand and you really haven’t wanted to play it anytime? It might be best to cut it and see if you miss it. Is there a sub-theme that you feel could get stronger in your deck? It doesn’t have to be Worldwake cards that might be the best fit. Decks don’t get better by staying the same. Even if you think everything is running smoothly, it won’t hurt to see what else is out there. Maybe there’s a new counterspell that’s a better fit for your deck (just kidding, counterspells aren’t good anymore). Cards change, Wizards’ philosophies change, cards get banned and unbanned. People will start getting wise to your deck and maybe have some cards to counteract your deck. If you’ve noticed I’ve said “maybe” plenty of times in this post; that’s because I just don’t know. You have to have an open mind when editing decks and realize that the card that you’ve been playing with for the past year may not be the best fit for the deck anymore. But, and here’s the best part, it’s not my decision do decide what’s best for your deck, it’s yours. All I can do is suggest things (sometimes strongly), not pound you over the head with a bat until you put it in there. You’ve been told to go to the dentist every six months, change your oil every 3000 miles and check your smoke alarms at daylight savings time. Your decks (no matter how often you play), should be looked at every three months, the amount of time between sets being released. Of course, there’s nothing wrong with doing changes every month or every week if you get new cards in trades or open new packs. If your playgroup is good, they will have adapted to your deck within that three month time and you won’t be winning as consistently, so a change of pace should be in order. It’s not buying 30 boxes of Worldwake, it’s looking through a trade binder and seeing that Chain Reaction you need for your mono-Red deck. It’s about working with your deck to take care of it, nurture it, and in return, it will be kind to you. If something could be improved, fix it. Don’t be afraid to take out that foil if it doesn’t work anymore. After all, you could trade it to another EDHer for something you do need to improve your deck. ‘Cause they’re looking to improve their deck too. 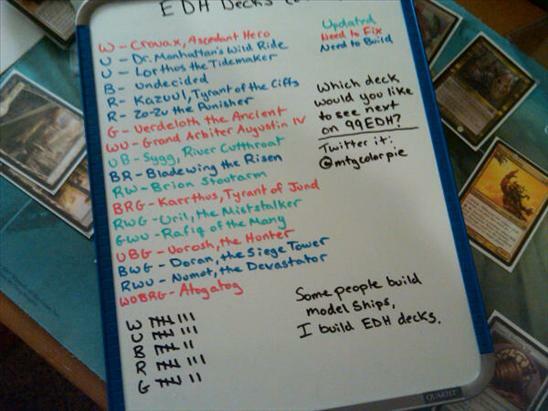 This entry was posted on Monday, February 15th, 2010 at 11:45 am	and posted in EDH, Worldwake. You can follow any responses to this entry through the RSS 2.0 feed.